We believe today's modern shed should be more than just a wooden box that stores stuff. That is exactly why we integrated a dormer, two windows, storage loft, workbench and shelf in the design of this 12x10 shed. The 6’ tall side walls give you plenty of vertical storage space for long handled tools and equipment and enough headroom to convert into a home office, art studio, yoga shed and personal sanctuary. The large 56” double door opening makes bringing lawnmowers, tractors and wheelbarrows in and out easy. 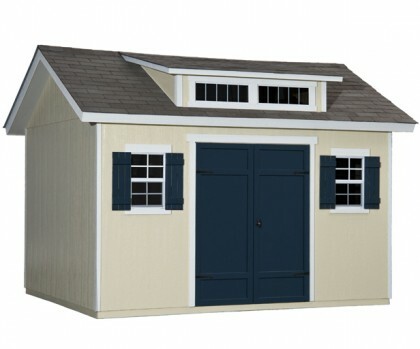 This shed also features an unique dormer design that will be sure enhance any backyard landscape while inviting natural sunlight inside. In a world where sheds are built to serve one boring purpose, this modern designed shed will change the way you think about sheds forever. Paint required: Siding & Doors: 3 gal. | Trim: 4 qt. Your local building authority may have specific requirements resulting in additional cost. Prices do not include painting, staining, permits, zoning and setback advice and/or compliance, excavation, or leveling beyond 6". All prices and content are subject to change without notice. Promotions are valid with online transactions only and cannot be used in conjunction with promotions at a servicing sales/distribution center or distribution center. Not valid on prior purchases. All stated sizes are nominal dimensions and approximate. Additional mileage charges (if applicable) and taxes will be calculated after checkout process is completed. Painted 12x10 shed is a representation only, arrives primed for painting in a light beige color. the shed was built in a timely manner and looks perfect. The only issue was I had to wait for a couple small pieces of trim to be finished by a different person since the initial builder didn't complete it. It has been at least five years, and my shed is still great. Thank you! Eventhough there was little delay.everything went well.i am satisfied with the workmanship and the installation.i will surely recommend you to my friends.thank you. I researched prices and quality quite a bit prior to my purchase. Shed Liquidators was by far the best value. The materials are not heavy duty but they are more than worth the price.